Research In Motion Limited® (RIM)® is a world leader in the mobile communications market and has a history of developing breakthrough wireless solutions. RIM’s portfolio of award-winning products, services and embedded technologies is used by thousands of organizations around the world and includes the BlackBerry® wireless platform, the RIM Wireless HandheldT product line, software development tools and software/hardware licensing agreements. RIM is seeking driven individuals who can take our wireless data products to the next level in the global wireless market. Are you ready to make a difference in the world of mobile communications with RIM? We are looking for Senior Interaction Designers to create compelling design solutions that cross both the mobile and desktop user experience, with a focus on media and content management for Mac/PC and Web applications. You are passionate about design and prolific in creating engaging visual content and design interactions with a meticulous focus on simplicity and elegance. You are well versed in the tools of graphic design and animation and communicate your ideas and concepts effortlessly using storyboards, simulations, prototypes or videos. As a member of the IxD team you will help to further understand and define user behaviors and interactions, exploring and proposing innovative features, developing and refining concepts and playing a key role in their implementation. You will work in a cross-functional team that includes usability analysts, engineers, marketing, product managers, as well as other interface/visual designers. The ability to quickly grasp and distill highly complex matters are essential skills. You must be fluent in user centered design methodologies and information architecture and be able to apply this knowledge across a wide range of platforms. You will be responsible for presenting and documenting your user interfaces designs. You will be responsible for developing user interfaces designs specifications and guidelines. As an advocate for the consumer, you strive for innovation and simplicity by leveraging research, strategic thinking and your experience, building relationships within a technology centric organization. Leading by example you will contribute directly to projects as well as through design direction, project reviews and leading brainstorming sessions. You will guide and mentor others on the team, sharing your personal strengths and experience. Ability to formulate and distill design rationale and guidelines for your work. If you’re driven to take wireless technologies to the next level, it’s time you join the team at RIM. We offer a challenging environment that fosters creativity and rewards excellence. Employees also have use of our award winning BlackBerry! Arktyp, a small UX design studio in Toronto, Canada is seeking a highly talented UX / Graphic designer to join their growing design team. You’ll be touching every aspect of the design process, from architecture to branding to interface design. We seek individuals that can look at a design problem from top down and bottom up – and understand how to treat every critical element. We don’t have IA’s, AD, CD’s here – we all architect, brand and design as a collaborative team. The designer is the architect and the usability expert and the brand consultant. We don’t segment these aspects of a web project to "groups", and the right designer for this job will excel at realizing, innovating and owning the interplay between these all these critical parts of the project. Ideal entries should be website portfolios and resumes as PDFs. This is a designer position, so if your primary skill-set is development/code, you need not apply. GUI designers are responsible for translating the visual components of the brand across interactive properties, working with photography, typography, video, animation and copy. GUI designers solve various user problems by creating elegant interfaces that clearly execute on design briefs while following user recommendations from various specialists within the web & game teams. GUI designers are proficient with translating wire frames, persona data, and information architecture diagrams into pixel-perfect, visually compelling designs. BigPark (www.bigpark.com) is a new media company that is creating innovative and entertaining social experiences for the rapidly growing online games and social network markets. We have assembled a team of world class designers, artists and engineers and have created an energetic and creative culture at our development studio located on the UBC campus. BigPark is a privately held company, founded by an experienced group of industry veterans. To apply, send an email with your resume to careers@bigpark.com. Please include Senior GUI Designer in the subject line of your email response. Rogers Wireless, Canada’s largest wireless carrier, is looking for a passionate mobile interaction designer to join our User Experience team, to be based in Toronto, Ontario. This individual will be responsible for the concept, design and execution of intuitive, highly usable, engaging user interfaces for all mobile devices and applications in Rogers Product Portfolio. The ideal candidate will possess excellent user interface design skills, a strong understanding of human interface design, and a natural ability to understand users’ needs. Previous experience in application and/ or web design is essential, while experience in mobile device design is highly desired. A gifted eye for aesthetics and attention to detail are a must. This individual is an analytic problem solver who can take user research, user & business requirements and translate them into user interface designs that are highly usable and engaging. Throughout the new product development process, this individual will be called upon to produce mock-ups, wireframes, storyboards, screen flows and prototypes (paper and/or interactive). As the successful candidate will design and produce all final graphical assets that will appear in Rogers mobile devices and applications, experience in icon design is essential. This individual will also help to author, implement and test detailed user interface specifications and will be involved in roadmap planning & coordination, user interface concept development and technical specification development for vendor use. The successful candidate will have strong organizational and problem solving skills, excellent communication skills both written and oral, and solid relationship building skills. The deployment of new products is the result of a team effort, so the ability to work in a team environment is required. Conceive, design and produce iconography and graphical UI elements for all mobile devices, applications and services. Develop a visual evolution roadmap for all iconography and graphical UI elements. Design user interfaces for mobile devices, services and applications in the Rogers Product Portfolio. Communicate, test and validate this UI designs by producing mock-ups, wireframes, storyboards, screen flows and prototypes (paper and/or interactive). Assist in ensuring new devices and applications are properly architected from end-to-end based on user experience guidelines. Testing and evaluation of new devices and applications. Providing user interface guidance to device OEMs and internal product managers for application development. Participate / co-ordinate conference calls between device manufacturers and third party vendors for product development. Provide support and assistance to New Product Development team members for all new product launches. Other day-to-day activities and/or projects as outlined by the manager. Post-secondary education (preferably in graphic design, interaction design, multimedia design, industrial design or a related field). 2-3 years of user interface design experience focusing on mobile (highly desired) web, or software applications. An outstanding portfolio of work demonstrating the successful delivery of innovative, easy-to-use, visually stunning interface design solutions. Ability to work effectively and independently on multiple simultaneous tasks within a fast pace environment. Proficiency in graphic design tools, including Photoshop and Illustrator. Proficiency in visual prototyping and wireframing tools, such as Visio, Illustrator and Flash. Excellent oral & written communication abilities. Strong problem solving skills, detail oriented, with the ability to manage multiple tasks, deadlines and priorities. Highly motivated individual with superior organizational and analytical skills. Willingness to work flexible hours to meet changing deadlines. Applications can be email to Markus Grupp, Manager – User Experience on Markus.Grupp at rci.rogers.com. NexKlix is seeking a self-motivated freelance user experience architect to work with our strategy and design team. Immediate work includes defining and designing the user experience for a leading Canadian financial news portal. Future projects will be given on a project-to-project basis. NexKlix is a Toronto based User Experience consultancy focused on defining, planning and designing online user experiences. The project is for a leading Canadian financial news portal. The project involves the planning and design of numerous features to assist users to find relevant markets information to make informed investment decisions. The work will include developing wireframes, functional specifications and executing informal usability studies. must be efficient in Omni Graffle on the MAC or Visio on the PC. This is an immediate position, only serious and experience persons apply. What do you get when you cross PayPal with Twitter? You get something that looks remarkably like RBC’s Mobex Mobile Payment Service. The service lets Canadians send money from their mobile phones. Feels kind of European. It’s like the future but it’s here right now. Basically, you sign up over the web for an intermediary account. The account is connected to your bank accounts and your credit cards. The service is currently limited to a maximum $100/day transfer. But it is not hard to see beyond these initial limitations. (The program is in pilot for “Friends and Family”). 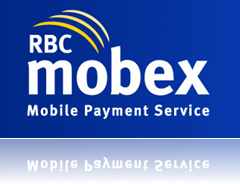 Participants in the trial are able to use the RBC Mobex payment service on their existing mobile phone, providing it has SMS – text messaging capability. 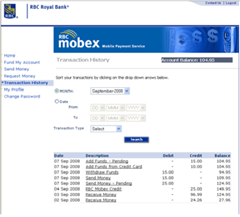 Users simply send a text message to RBC Mobex with the dollar amount and the recipient’s cell phone number. Funds are then taken from the sender’s Mobex account and moved to the recipient’s Mobex account. The recipient also receives an instant text message on their cell phone to let them know when the money has been sent to them. You can add money to your account from your bank account or your credit card as a transaction. That means it’s not a cash advance and you’re not charged the loan shark interest rates. It is interesting to connect accounts to a mobile phone number. Now that Canadians have Mobile Number Portability it is possible to start using these as unique identifiers. (There are still open questions about the longer term use of mobile phones a unique identifier). It is interesting to see a Canadian financial institution build prototypes and begin to investigate the marketplace for alternative payment tools. It is not that the financial institutions are stagnant, they continue to build services like Email Money Transfer with Interac. I wonder how many Canadians have PayPal accounts? But this is a great attempt to build the next generation of personal banking solution by an existing trusted institution. It will be interesting to see what the next generation of Canadian consumers think of using their mobile phone as a banking tool. With 58% of 12-17 year olds owning a mobile phone (Forrester’s Consumer Technographics Q1 2005 North American Youth Devices & Access and Finance Online Study) and over 76% of US households increasing to over 90% for GenY homes, it makes perfect sense to bet on the mobile device as a the starting point for cashless transactions (Forrester Benchmark 2008: Mobile is Everywhere by Charles S. Golvin). This is RBC making a really strong bet on building a Canadian mobile monetary platform without having to rely on the carriers. The carriers are just that, carriers of the SMS and HTTP packets that reach mobile phones, mobile web browsers and web browsers of the banks customers. I wonder if there is a way that they can or will build this beyond the Canadian borders. Good on RBC, they seem to be putting a stake in the ground based on solid research. CanUX comes immediately after StartupEmpire in Toronto. I am clearing my schedule to travel to Banff and spend some quality time at a great user experience conference. That and apparently ski season opens at Sunshine on November 7, 2008 so wax up your board(s) and get ready to for a UX conference that is unparalleled in intimacy. It is a great conference for designers looking for an opportunity to connect with other designers and speakers in an intimate environment, to learn about techniques, methods and tools to improve their craft. It is a great conference for developers looking to expand their understanding of how designers, developers and strategists work together on real world projects. Tipping Canoe is an international web development company with a passion for creating influential and creative consumer based sites. We believe that the relationship between consumers and merchants is changing rapidly and that the clever consumer is influencing a massive shift in the traditional power dynamic. We believe that the future of online advertising and purchasing will be radically different than today and that this revolution will be based on connecting clever consumers. Our success in this field and the immense growth we are experiencing means that we are constantly looking for motivated, intelligent and switched-on developers who are as excited as us about creating and nurturing cutting-edge web technologies. Please find details below on our currently open positions. Shoot us a note using the contact link below if you want to talk more! You must have a passion for emerging web technologies and an interest in the rapid changes occurring in web interface design. Our ninjas work on the leading edge of web applications and you will be given freedom to experiment with new theory and practice. You must be comfortable working with, and troubleshooting in a high availability business critical environment and be the sort of person who likes to ‘own’ what you set up. We offer our people a lot of autonomy and responsibility and welcome those who are driven and who love what they do. We’re also happy to offer what we consider to be a fantastic work environment, and have a commitment to paying people what they’re worth. To apply for any of the positions, please send your resume and a brief cover letter here.